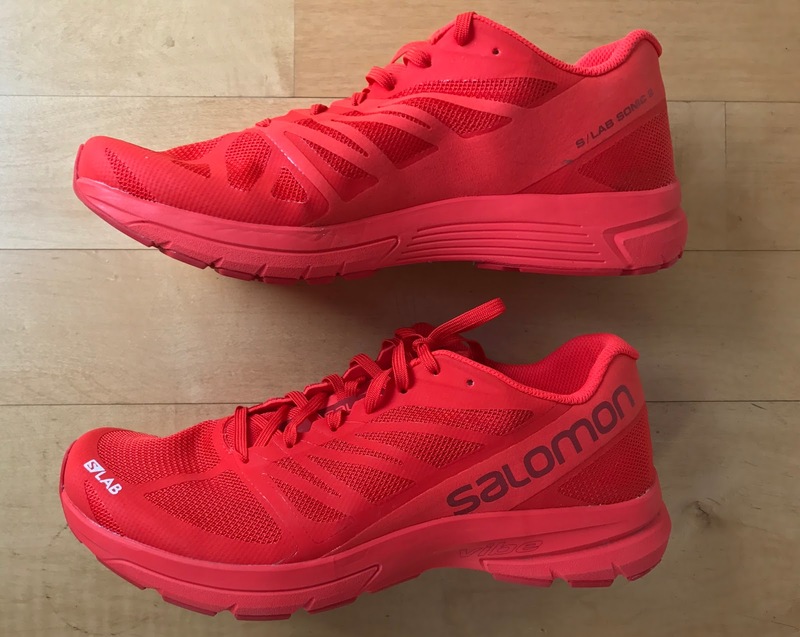 Road Trail Run: Review Salomon S/Lab Sonic 2-Highly Responsive Long Racer with Vibration Attenuation. Review Salomon S/Lab Sonic 2-Highly Responsive Long Racer with Vibration Attenuation. 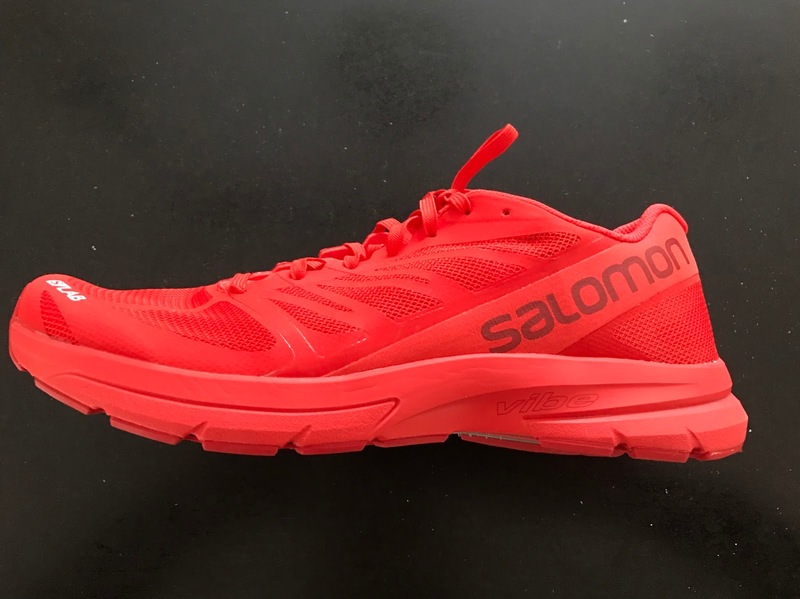 Salomon recently introduced 3 road running shoes Sonic trainer (review here), Sonic Pro 2 performance trainer (review coming soon) and S/Lab Sonic 2 long haul road racer. The S/Lab Sonic 2 is available online in the US including Running Warehouse here. The Sonic Pro 2 and Sonic is available at select speciality running stores in the US (list coming soon) and some online and speciality retail in other countries. The three models share many common traits and represent a logical progression in cushion and response from training to racing. They all have a similar firm and stable, responsive yet largely vibration/shock free and energetic ride. 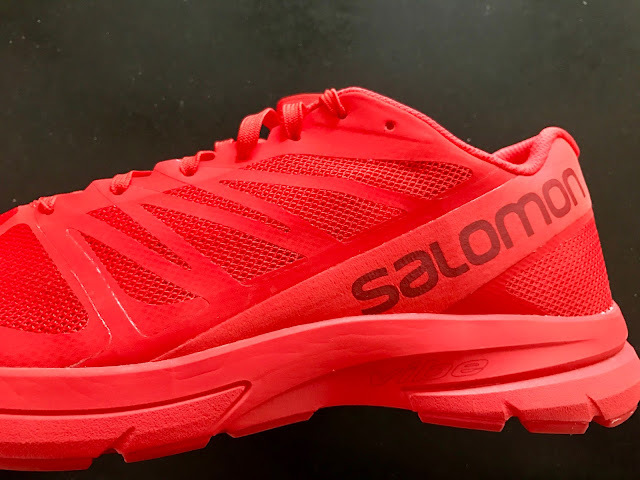 While all road shoes, Salomon's long time and storied trail running heritage is reflected in the design. Not to be mistaken these are not trail shoes but all the models can be easily go from door to trails without compromising road performance. Full coverage Contragrip outsole over a Pro Feel midfoot chassis in a system designed for geometric decoupling and smooth transitions. The Sonic 1 and Sonic 2 were designed with input from Max King, World 100K road champ, 2:14 marathoner, 6th in the Olympic Trials Steeplechase in a PR, World Mountain Running Champion, with I think some obstacle course championships thrown in and according to this Competitor article all in the the last few years! Last week he won the US 50K Trail Championships. Clearly an incredibly versatile and top level runner who trains and competes at the highest level on all kinds of roads, trails, and tracks. 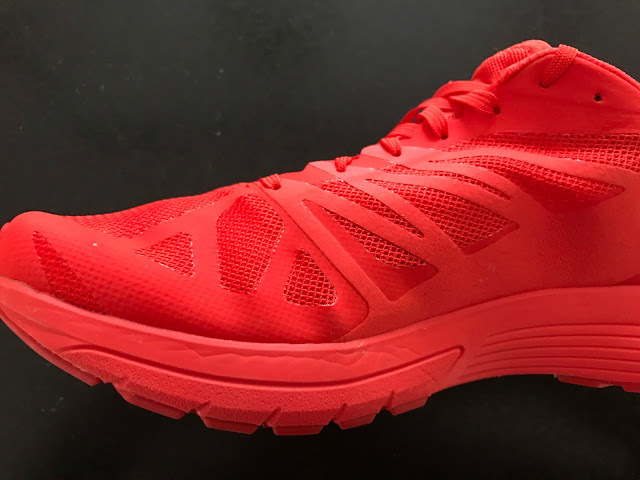 Max was kind enough to share what he was looking for in his long haul race shoe with Road Trail Run: "For me the fit is superb and the ride and ground feel are smooth. I was looking for something to race road marathons and ultra marathons in so it needed a good mix of being lightweight with enough cushion to absorb the hard miles. It satisfied both for me. I also used a version of it for Comrades last year." We totally agree with Max! We think the S/Lab Sonic 2 is an ideal "marathon pace" shoe. By this we mean that while you can find snappier road flats and softer performance trainers, its blend of high response, cushion and upper comfort is ideal for fast, hard long miles. The Sonic 2 fits me true to size but unusually for me and certainly unusually for Salomon with thinner socks I could easily see sizing down half a size. Obviously Max King has "American" and not "European" feet! The upper is beautifully crafted of very soft,single layer very breathable mesh with thin flexible overlays which wrap the foot without any pressure anywhere. Keeping in mind the Sonic 2's purpose, marathons and ultra marathons, often in heat, the fit is roomier and more relaxed than a typical race shoe. The thin tongue is minimally padded. It is integral to the interior EndoFit bootie. The stretchy EndoFit sleeve, also a feature of the Sonic Pro 2 and Salomon's S/Lab trail shoes, gently but decisively holds the foot in place over the platform without having the upper resort to heavy midfoot overlays or straps. The sockliner is a thin flat EVA and is glued down in the front but not the back. The exterior Sensfit overlays tie into the laces. They are thicker and more extensive on the medial side (first picture below than on lateral side (second picture). This is all relatively speaking as the Sensifit overlays are thinner and more flexible overall that typically found in a race shoe. The lateral side has thinner and fewer Sensifit overlays. The heel counter is high and firm. I get great stability in the heel area even when tired, reminding me somewhat of the Brooks Asteria but without resorting to a firmer heel midsole insert as Asteria does. This said the foot opening is quite broad and a bit loose, especially just back of the lace up so using a lace lock through the last hole is a good idea and something I will try. The rear of the shoe heel counter construction allows the front to be more minimal and less constricting than a normal race shoe without compromising foot hold and allowing more flexibility up front. 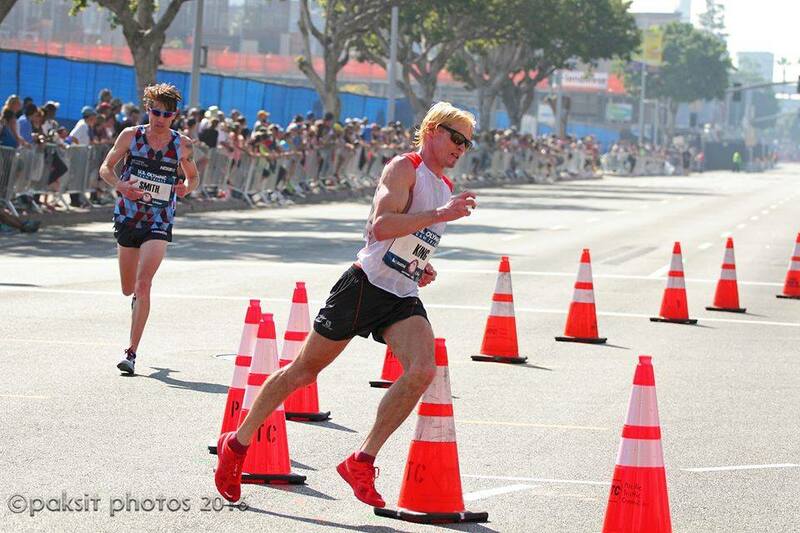 A great approach for a heel striker like me, and most as we all end up on the heels in the later miles. The toe box is wide and soft for a race shoe with a fairly high, firm, and extensive toe bumper to hold all that soft mesh in place around the foot. Works brilliantly! The laces are very thin and flat. If I had one criticism is that the laces could be a touch more substantial or the tongue a touch more padded as they bite a bit over the lace up but then again thicker laces might take away from the seamless sock like secure feel of the rest of the upper. The midsole is made of a single density of Salomon's high rebound EnergyCell+ EVA. It's firm and trail worthy but... EnergyCell+ foam is only part of the cushion and response story. At the heel Salomon inserts Opal, its very soft TPP material. Softer than TPU, this 6mm insert is designed to attenuate tibial vibrations. It works and very well indeed for me! 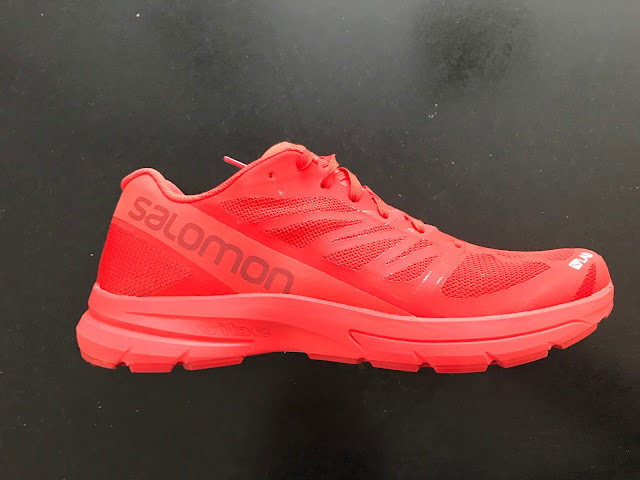 A Salomon bio-mechanist explained to us at the Running Event (see article here) that the forces measured during stride are generally made up of 50% shock, 15% rebound, and 35% vibration. Vibration is a huge component of the input load and is mainly made up of tibial vibration. Beyond the muscle, skeletal and nerve impacts there is also the perceived comfort impact of reducing vibration. The S/Lab Sonic 2 and Sonic Pro 2 have 6mm thick Opal inserts in the heel only. The trainer Sonic has a 12mm insert at the heel and a 6mm insert in the forefoot. The Opal insert while not replaceable is not glued into the heel cavity. Opal sin an interesting twist also seeks to also reduce the vibrations of shear or side to side forces. As it is not glued into the cavity in the midsole, this so has to provide less interference for its movement under load or have any interface of glue between it and midsole. The reduction in side sheer side forces is noticeable on the run as is of course the reduction in vibration from vertical forces. Vibe is subtle and effective and in our view is not a gimmick! 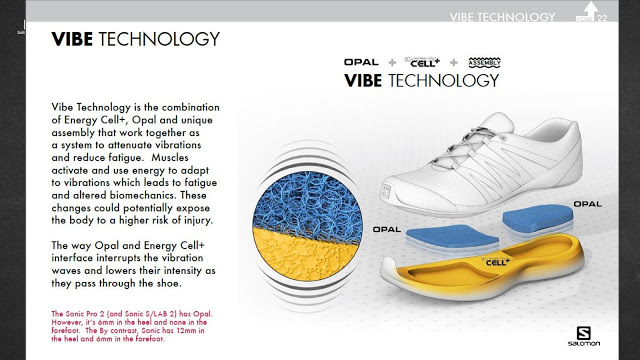 Does Opal and the Vibe technology work together as a system? Absolutely in our opinion. Unlike more conventional race shoes' firm EVA's such as New Balance Revlite, there is noticeably less shock vibration transmitted and for me usually such firm midsoles don't work. With the Sonic 2 I get snappy firm response with far less shock discomfort. Clearly a different approach from bouncy TPU or TPU based midsoles such as Boost, Everun, and Altra's EGO. The outsole is Salomon's Premium Wet Traction Contagrip and plenty of it. So great wet traction and lots of durability. At approximately 30 miles I see only slight wear on one heel. The outsole appears to have dual density rubber with firmer rubber at the high wear heel areas. It is geometrically decoupled to smooth transitions. 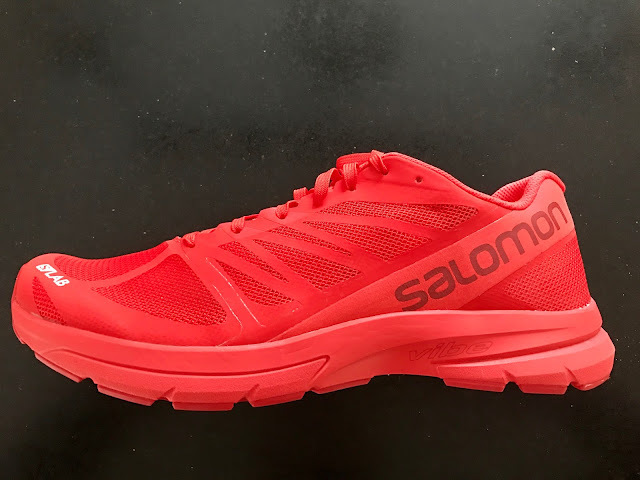 Under midfoot we see Salomon's ProFeel protection and stability chassis, which is similar to adidas's Torsion or Salming's Torsion Efficiency unit but more minimal as it is thin TPU film rather than the firm plastic plates of the others. The result is a smoother more subtle transition to toe off than the adidas in particular with great stability and direction forward even when tired. 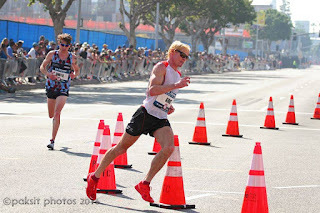 It is may be a touch less dynamic than some races shoes, more flowing and smooth than snappy and thus more suitable for me for "marathon pace" than all out 5K or 10K pace. The Sonic 2 has a distinct toe spring at the level of the last lace loop which appears after running 20 or so miles, in a very similar location to that of the Adios Boost 3 or Boston 6 and it is a toe spring location I prefer to those further back, say for exampl,e the flex point of the Saucony Freedom ISO. Forward of the toe spring area the Sonic is fairly stiff. It does take 20 or so miles to break in the flex as they are initially stiffer. So, don't take them out of the box and race them without a few miles on them. The ride is firm and responsive with noticeable heel shock and vibration attenuation from the Opal heel insert. The Sonic 2 is perfectly comfortable and suitable as a daily trainer for those who like a firmer ride but shines at marathon to half marathon pace for me. The transition is very smooth, flows along and the response off the road is noticeably snappy and well distributed over the outsole. At slower paces the transition is a touch more labored. I have recorded the lowest ground contact times from my Scribe Pro pods in the Sonic 2 of any shoe I have tested. While certainly firm my legs after hard efforts have not been nearly as trashed as I would expect. The Sonic 2 will be as of right now, but you never know what might come next, my 2017 race shoe for 10K to marathons, for most sub marathon races replacing the adios Boost or Boston 6. I will train in it as well. It's comfortable, roomy for a race shoe yet with a secure upper. It should be ideal for warm weather races and wet conditions. The response is outstanding. This shoe is ideal for "marathon pace" and somewhat faster running. Even though "firm" the blend of the EnergyCell+ EVA, the Opal insert, and the full coverage Contagrip outsole makes for a comfortable fast shoe for long distance racing, exactly what Salomon created it for. -0.05 for sizing. At true to size it may be a touch to roomy for a race shoe for many. The Sonic Pro 2 is identical in stack, midsole, and outsole to the S/Lab as far as I can tell. It has a heavier, more dense mesh upper and Sensifit overlays. Instead of the flat thin EVA sockliner of the S/Lab it has a conventional Ortholite sockliner It weighs 0.7 oz more and costs $40 less. As a performance trainer it is most fine. However, and I am not sure exactly why, but suspect a combination of the lighter weight, thinner sockliner and softer more flexible upper, the S/Lab is noticeably livelier, snappier in transition while only being ever so slightly less cushioned feeling front and back. The trainer Sonic has a similar firm ride but noticeably more Opal cushion front and back reducing vibration and shock yet further. It is heavier by almost 2 oz and is $50 less. It's more heavily built upper makes it a great door to trail option. I ran the predecessor X-Series a lot on both road and trail preferring it for trail. It was just to firm for me on the road. Its upper is considerably snugger and has a quick lace. The Sonic 2 is a far more comfortable and versatile road racer. I did not run the S/Lab Sonic 1 but see it has considerably more Sensi Fit overlays and no Opal inserts. Both have a relatively relaxed midfoot fit for race shoes. The Sonic 2's upper is better executed overall. The heel ride of the Adios is softer and while firmer the forefoot ride of the Sonic 2 is less tiring as it is more flexible in front of the flex point than adios. The firm quick response of the Sonic is in sharp contrast to the soft slower compression of the Adios meeting its Torsion plastic and outsole then rebounding back. The toe flex is in about the same place in both with the adios stiffer forward of the flex. While I have not yet raced the Sonic 2, my fast runs in them tell me I will prefer the Sonic. Many of the same comments as for the Adios as to response. The Boston has a nice well held engineered mesh upper front contrasting with its plastic banded mid foot saddle, so a tale of two supports. The Boston is more flexible than either the Adios and Sonic 2. The Sonic 2 fit is all of a piece if a bit roomy. The Boston maybe a bit more suitable for a very hilly marathon course. Completely different rides with the Saucony having a soft and springy ride and a very unstructured heel unlike the Sonic 2. As my form gets sloppy later in hard, long runs I prefer the Sonic's stability and snappy response. The Hupana has an equally smooth transition but it clearly softer. It rebound is noticeable, steady and slower than say Boost without the pop of the Sonic. The Sonic is definitely a firmer ride and has a somewhat less supportive but more comfortable upper than Hupana's dense knit. 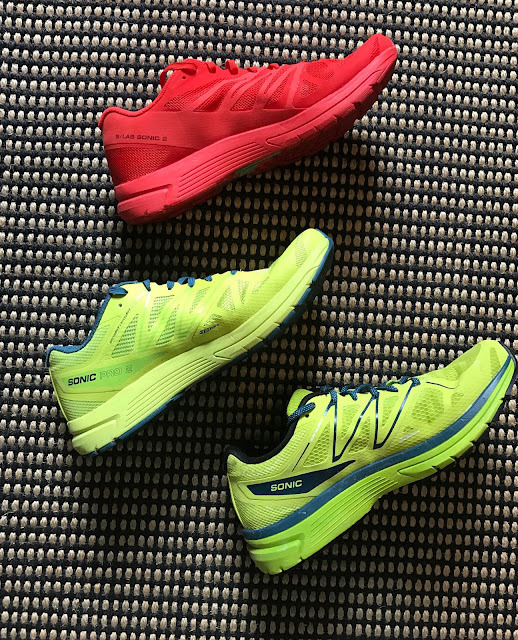 Hupana is a better choice for slower miles as a light and cushioned trainer, Sonic for speedier race and tempo miles. Probably the closest match all around. The Salming has a similar firm ride but.. transmits considerably more shock and has a less comfortable upper. Another close match. Both have great roomy uppers. While softer, the Escalante has a distinct rebound and is stable due to its combination of lots of firm outsole rubber and bouncy EGO midsole. I would reach for the Escalante for at 10K up to a half but will go with the Sonic 2 for half and above. I do need some heel drop as the miles go on and Escalante is zero drop. Both have stable heels and very comfortable forefoot areas. The Asteria with its dense EVA insert is firmer in the heel. It has a very flexible flex point forward of the Sonic's so relatively stiff overall Nod to the Sonic here. Two completely different race animals. With a very narrow heel landing and very stiff flex with little toe toe spring due its long plastic plate, the Zoom Streak favors mid to forefoot strikers with good form. It will do you few favors as your form falls apart. A fast shoe but I take a pounding in them. Haven't run the Zoom Elite 9 yet but likely a closer comparison (Peter Stuart's Zoom Elite 9 review here). The S/Lab Sonic 2 was provided at no charge by Running Warehouse and Salomon. The opinions herein are entirely the author's. Thanks for this very interesting review. I've run around 600kms in the X-series and really like them overall. They may seem a bit harsh sometimes, often at the begining of a run, but them still seem to soften a bit after some kms. Really a good shoe, with impressive durability (the sole seems new, no puncture of hole in the mesh...impressed). Judging by your review, the Sonic 2 looks like an improvement over the few bad spots I see on the X-Series (better fit, less harsh on roads). Excellent review, thanks for that. Do you think the Sonic 2 would be as suitable/better as the Boston Boost 6 for daily training up to 25km? Stuie, they are an amazing ride, but roomy for a race shoe. As far as durability they clearly have as much or more rubber than many trainers. That sounds good, I would not be racing in them, I use the Nike Zoom Streak 6 for those days! Just a light responsive daily trainer with enough cushion for between 10 and 30km days (more 20 and less to be honest). thanks for your review! i have been reading your reviews on all salomon shoes, and i value them very much! i have been running in slab sonic 1, used them for road marathons and ultras. last ultra was 68 miles in mostly rutted and rocky single track (after so much rain here in souther california!) in santa monica mountains, it worked perfectly! i also have the slab sonic 2 and love them. 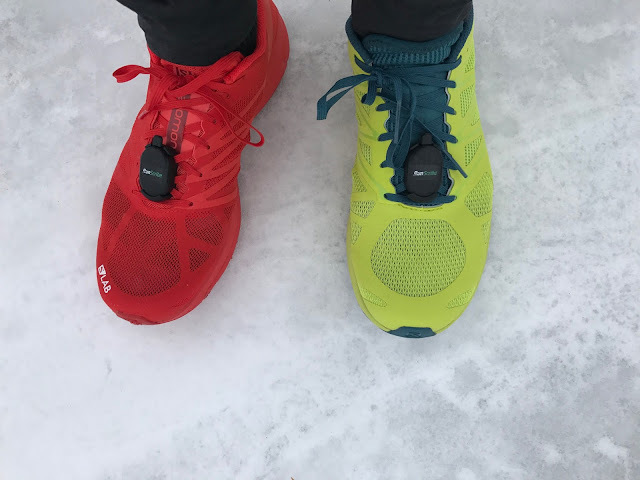 for both of my shoes, i purchased and installed salomon quicklace in red to match the shoes, and it worked flawlessly. Thank you very much David! Much appreciated. Great job on your Ultra. Salomon really makes great run shoes and gear, especially the S-Lab collection. We will soon have a review of the Sense Pro Max the first super cushioned yet light Salomon. Equally good on road or trail, a hard thing to pull off. Sam, Editor. after i bought a pair of s lab sonic and after 300 km the sole is brand new but the new material they used for the upper fit is totally destroied and i'm a natural forefoot runner of 70 kg.not to mention the quicklace that i love so mutch are desappear. Hi Anonymous, I too enjoyed the X Series but for me best on trails. Too firm beyond 10K racing on the road whereas the Slab Sonic 2 due to the Vibe is not for me. Also the X-Series upper was almost painfully snug and I am not a huge fan of the quick lace but that's what you need in a fast trail shoe. The S-Lab Sonic 2 is intended for the road and I can see how the light upper could get destroyed with regular trail use. It would be nice if you provided detailed information on what sizes you wear on different shoes :) It might certainly help to find a proper size if you don't have a chance to try these on. I ordered this S/Lab Sonic 2 from Salomon as they had Hydration vest + shoes discount offer and found out that for me 40 2/3 is actually small. I have Salomon Sense Ride in 40 2/3 and it seems about the same than my Boston 6 41 1/3. Now I am thinking if even 41 1/3 will fit me. I'm a bit late to the party, but the s-lab sonic 2s must be one of my favorite shoes of all time. I'm using them mainly for trail running, but they lack grip and a rockplate and my feet get beat up on more aggressive trails. So my question is, what shoes would be similar in the ride, cushion and lightness to the sonic 2s, but are better on trails? I've tried most salomon shoes already. Sense 6 = too harsh, ultra = too heavy, ride = poor fit. I'm think maybe the Torrents might work, but the 5 mm drop worries me. A great shoe indeed! For sure Torrent! Don't worry about the drop.It is not as versatile for road as Sonic 2 is. You might also look at NB Summit Unknown, which I found really good on road as well but a bit low over the toes for my fellow reviewer Jeff but not me. Another to look at is the UA Horizon BPF, I really found them excellent on steep terrain at a recent 25K trail race. If you were OK with similar grip to Sonic 2 the new Salomon Sonic RA or RA Pro are worth looking at. Road shoes but can function on trails. We also just posted our review of the Sense Pro 3. It is firm with very aggressive grip. See reviews of all at the link below and many others. Thanks for the fast reply! I'll definitely check out the Torrent now. If I like them I might even try the Evo Mafate next. I have very high arches and instep, so I don't think the NB will work. I really wish Salomon would make a trail shoe out of the Sonic 2s. They run so much nicer than any of their trail shoes. Well maybe with custom ME:SH shoes I might be able to create my own. Funny thing was Kilian was running in a pair of Sense Ultra's with the Sonic midsole (+vibe) during the Mont Blanc Marathon.